The London Knights are the leading lights after round one of the GCL Shanghai, seizing pole position ahead of Saturday’s crucial decider. The classy pairing of Ben Maher and U25 rider Emily Moffitt led the cavalry charge from the off and their double clear proved unassailable. Berlin Eagles' duo of Ludger Beerbaum - who makes his return to CSI5* level following injury last year - and Christian Kukuk were the only other team to go clear. But their mighty challenge was not quite enough to beat the scorching time set by the scarlet-coated Knights. A stylish and passionate crowd greeted every rider with huge enthusiasm. So involved in the action were the spectators that groans and cheers could be heard at every fence as they experienced first hand the highs and lows of the sport as 19 teams, represented by an exciting mix of some of the best riders in the world, staked their claim in this the third leg of an enthralling race to the GC Prague Play Offs. Whose tactics would pay off? Which teams have come up with the best strategy to earn maximum points? The anticipation was incredible. As pulses raised in this buzzing metropolis, the spectacular arena — bathed in sunshine and overlooked by the imposing red China Art Palace — provided a bustling amphitheatre for battle to commence. The Longines Global Champions Tour has taken the sport to a new level in Asia, and fans queued at the gates from 09:00 in the morning to witness this incredible spectacle in Shanghai, the most Eastern stop on the 17 event Championship. As well as top sport, guests could also enjoy the stylish shopping in a picturesque village, entertainment and vibrant hospitality area. Uliano Vezzani had built a typically clever course, which looked manageable but with plenty of places to catch out riders as they looped around the spacious arena, horses requiring the power to soar over wide oxers and the care to ping the towering verticals, particularly the double to finish, with riders needing to keep organised. “It’s a nice start, every jump is difficult but it’s a nice relaxed start,” assessed Christian Ahlmann before the start. Powering out of the starting blocks, the London Knights quickly gained the upper hand, with Ben Maher and Explosion W scorching round for a sizzling clear — an outstanding 12sec inside the time — before his student and U25 rider Emily Moffitt challenged in fine style to put the pair in on a zero score. The bar was set sky high, but this solid pair had made the course look deceptively easy and the pressure told as poles started to fall. The only other team to remain faultless was Berlin Eagles’ Christian Kukuk and Ludger Beerbaum, at his first show back after suffering multiple fractures to his arm in a fall. The Eagles and Knights will be going head-to-head tomorrow is a tantalising prospect, but with a large portion of the field remaining on relatively low scores, it’s going to be extremely tight going through to Saturday’s decider. “It doesn’t happen very often when you hold on to the lead till the end – some riders got very close there at the end, though,” said Maher, who plans to ride the Poden Farms-owned Explosion W again in the second round of the GCL. Among the chasing pack heading into round two on four faults are Doha Fursan Qatar, represented for the first time this season by Michael Whitaker and team-mate Sheikh Ali Al Thani. They are joined by series leaders Valkenswaard United, who already have two podium finishes on the cards and look poised to pounce alongside the ever consistent Monaco Aces and Chantilly Pegasus, whose Roger Yves Bost produced an incredible clear, one of only 11 in the competition. 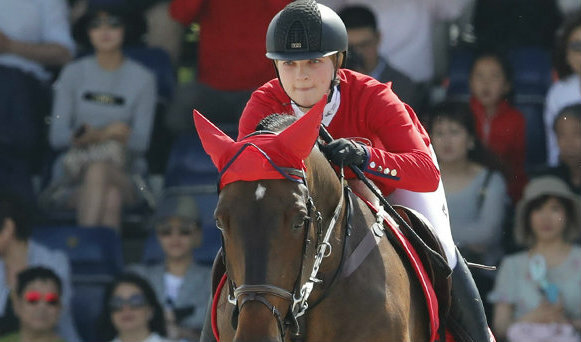 Proving how crucial time-faults can be, the home team Shanghai Swans drew the team competition to a close with a score of five courtesy of U25 rider Alexandra Thornton and a masterful clear from Daniel Deusser, while St Tropez Pirates sit just a whisker behind on six. Paris Panthers, Scandinavian Vikings, New York Empire and Madrid In Motion — whose U25 rider Michael G Duffy produced one of the day’s star performances — are all hot on their tails, carrying their eight-fault totals through to Saturday’s clincher. Mexico winners Miami Celtic ran out of luck for a surprise team total of 12, as did the Prague Lions, who had been sitting second in the championship race having snatched a sensational victory in Miami Beach. With the top 16 teams qualifying for the GC Prague Play Offs in December, the pressure is on to keep those points rolling in as the championship continues to hot up. The second round kicks off in Shanghai at 12:15 local time, with all the action streamed live online via GC TV. For the full schedule, please click here.